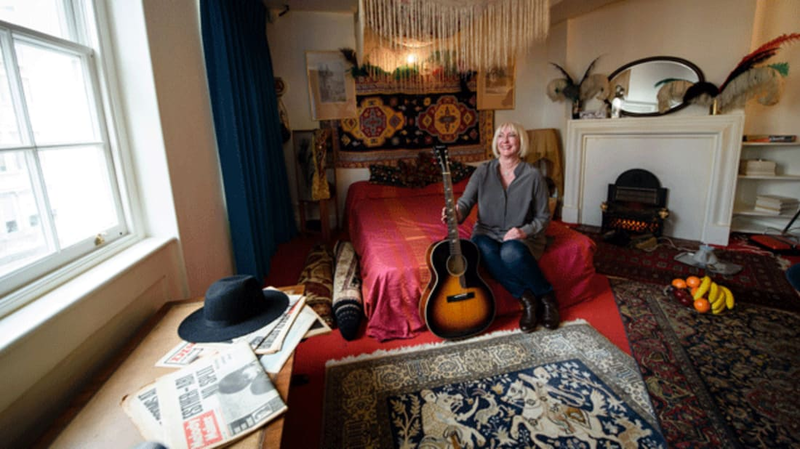 Starting this week, the public is free to visit the London flat where Jimi Hendrix lived for a year in the '60s. The apartment on the third floor of 23 Brook Street in Mayfair was occupied by Hendrix and his girlfriend Kathy Etchingham from July 1968 to March 1969, and though their time there was brief, it was, according to Intelligent Life magazine, the closest the rock star came to having a true home during his four years of fame. Using £2.4 million provided in part by the Heritage Lottery Fund and private donors, the space has been lovingly restored to capture how Hendrix would have lived during his stay. According to Londonist, the living room that doubled as the musician’s bedroom has been made up with bohemian decor and '60s-era anachronisms like corded telephones. On his bedside table sits a pack of Benson & Hedges cigarettes, a tape recorder, and a bottle of Mateus Rose—the couple's favorite wine. The building also includes an exhibition space that showcases a recreation of Hendrix’s record collection, a timeline of his life in London, and his beloved FT79 acoustic guitar. The apartment building where Hendrix lived was also home to the famous German composer George Handel from 1723 until his death in 1759. The rest of the house is used as museum dedicated to the composer, and the building is now branding itself as Handel & Hendrix in London.